I think my intense curiosity to discover new foods and tastes ultimately determined my fate to become a professional chef. I haven’t lost that interest over the years, and I especially enjoy searching out recipes with unique techniques and flavors…and the Eastern Mediterranean becomes my most often visited playground. I came across this walnut and cardamom flavored biscuit from Azerbaijan while trying to find something else entirely different…and before you ask, I do know Azerbaijan isn’t really near the Mediterranean, but it does have a heavy middle-east influence, so let’s go with it. 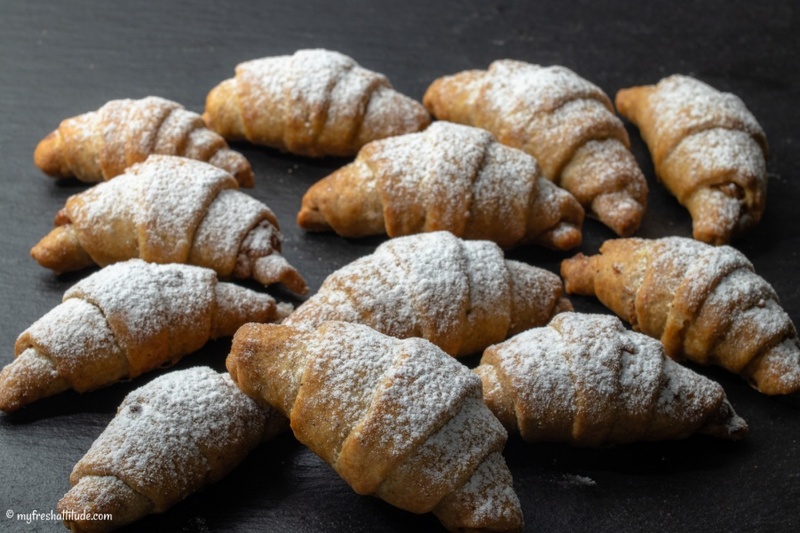 The recipe intrigued me almost immediately because of the shape, which is similar to little croissants. Incidentally, the name is inspired by little pillows that people like to lean on in Azerbaijan, and I find that little nugget of information inspired because it just denotes a very relaxed attitude. I also adore the flavors: walnuts, raisins, cardamom, vanilla and just a touch of orange. Do you see the Mediterranean influence? My vegan version relies on unprocessed rapeseed oil as the fat in the dough to shorten the gluten in the flour (this is why fats are called shortenings) and produce a flaky and crispy pastry. The yogurt (soy in my version) is an interesting addition to the dough. Yogurt functions in a similar way as buttermilk in baking; it has just enough acid to combine with the baking soda and help create a rise in the dough and a slight browning reaction.